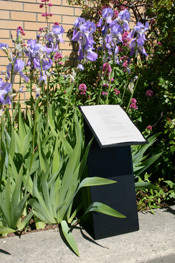 Poetry walks are one of the recurring themes of this site, but somehow we managed to overlook one that’s very close to home: the Poetry Garden at the Seattle Center. Created in 2007 by John Hoge, the garden is a quiet spot for strolling and contemplation that includes eight sculpted red granite boulders, each one etched with a contemporary or traditional poem. Do you hunger for poetry? Do you wax poetic about food? Do you value community? Well then, surely, you will want to grab this opportunity to fulfill all three appetites: Taste for Poetry 2014. Each year, the Sue C. Boynton Poetry Contest cooks up one major fundraising event, calling upon the exceptional culinary talents of the folks at Ciao Thyme and the exceptional literary talents of a featured poet. The results are delicious, memorable and not to be missed. 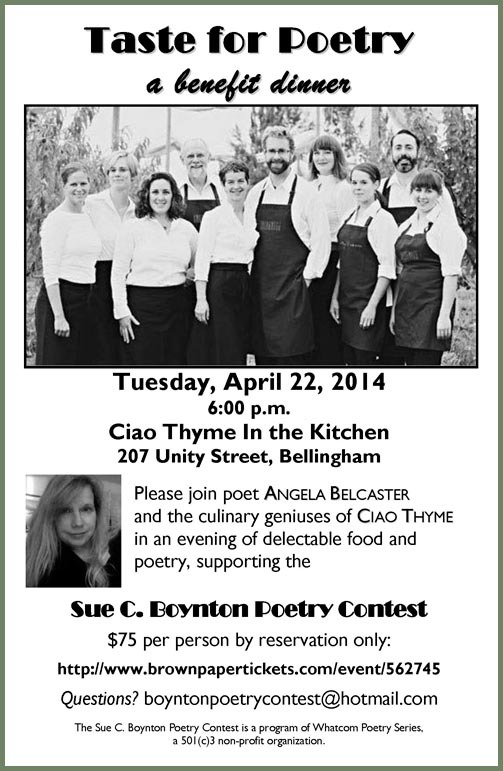 This year, Taste for Poetry will be held at Ciao Thyme in Bellingham on Tuesday, April 22. The featured poet will be Angela Belcaster, a Boynton winner in 2007, 2008, 2009 and 2013. Space is very limited, so invite your favorite dining partners and hurry over to Brown Paper Tickets to guarantee your seats at the table. The Geraldine R. Dodge Poetry Festival is a celebration of poetry that immerses participants in four days of readings, performances and conversations. The Festival is the largest poetry event in North America, attracting audiences of 14,000 to 17,000. Held in even-numbered years since 1986, the Festival will take place in Newark, New Jersey, October 23-26, 2014. Participating poets will be announced during National Poetry Month (April) and tickets will go on sale at that time. To stay up to date, visit Dodge Poetry online and the Geraldine R. Dodge Poetry Festival on Facebook. Valentine’s Day may be over, but there’s no season on love. Common Good Books (Garrison Keillor, prop.) invites you to submit an original and unpublished (anywhere!) love poem for their second annual “Love Letters” contest. There’s no fee, but poems must be submitted by U.S. mail (postmarked by April 15, 2014) and accompanied by a signed release form. Submission details and release forms can be found on the Common Good Books “How to Write a Love Poem” page. Chuckanut Sandstone Writers Theater and Bellingham Repertory Dance Company have just announced the winning writers for the collaborative event, Phrasings: In Word and Dance. Phrasings 2014 will offer three performances of original works on April 11, 12 and 13 at the Firehouse Performing Arts Center in Bellingham. Mark your calendar, watch for ticketing information and plan to attend this dynamic collaborative event. Whatever your aspirations or accomplishments in the literary world, if you live in the Pacific Northwest, there’s a good chance you’ve caught the AWP buzz. The 2014 Association of Writers & Writing Programs Conference & Bookfair opens in Seattle this coming Wednesday, February 26, 2014, featuring some 2,000 presenters, 550 literary events, 700 886 exhibitors and an anticipated 11,000 attendees. The two primary venues are the Washington State Convention Center and Sheraton Seattle Hotel, with scores of off-site events at bars, clubs, bookstores, Hugo House and other lit-friendly locations. If you have not registered, you can still do so, both in advance and in person at the Conference beginning on Wednesday. AWP has announced that “The bookfair will be open to the public free of charge on Saturday, March 1.” This is good news for both visitors and exhibitors. AWP has also announced that the reading by Jane Hirshfield and Sharon Olds at 8:30pm on Saturday, March 1, is also free and open to the public. Wondering if AWP is for you? Ask around (and check the blogs of your favorite local writers). Chances are good a writer you know has attended AWP and can give you reasons why it’s worthwhile and how to get the most out of it. If you have some time (you’ll need some time—it’s a monster), take a look at the Schedule (you can also download it as a PDF). Once you’ve registered, most events are free (some off-site events may have a cover charge or suggested donation). Follow the latest news about AWP and the Conference on the AWP page on Facebook. Not this year? The AWP Conference & Bookfair is an annual event, so you can mark your calendar and start planning for: April 8-11, 2015, in Minneapolis; March 30 – April 2, 2016, in Los Angeles; and February 8-11, 2017, in Washington, DC (the 50th Anniversary and likely to be an even bigger deal than usual).